The Campbell House built in 1892 and fully restored as a grand historic inn offers personalized service comfortable surroundings and all the amenities one would expect from a fine hotel. From its fully restored elegant rooms to the exquisite buffet breakfasts the Campbell House is truly a gem of the northwest. 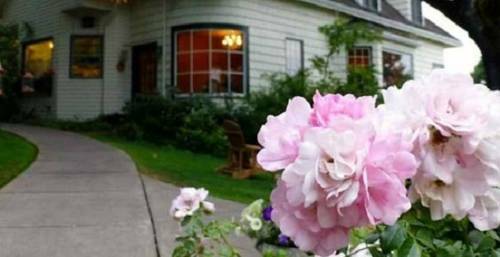 Overlooking Eugene Oregon on one acre of beautifully landscaped grounds The Campbell House Bed and Breakfast Inn offers classic elegance exquisite decor and impeccable service. Each of the eighteen beautifully appointed guest rooms have en suite bathroom television telephone and other fine amenities. Selected rooms also feature a gas fireplace fourposter bed and a claw foot or Jacuzzi tub. Ground floor meeting and sleeping rooms offer easy wheelchair access. High speed wireless internet fax and photocopy machines are also available. Children 12 years and under are charged 10.00USD extra child charge and Children 13 and up are charged extra adult charge of 25.00USD. University of OregonPearl Street to 7th Ave. Left on 7th Ave 1.2 miles.